This shall be a pretty photo-filled post! I am absolutely excited to share about my first Jewelmint purchase. Jewelmint is a subscription-based website where members got to select one piece of jewellery each month. The styles were allocated based on a fashion quiz that one would take when signing up for the website. New designs were released periodically, and the classic ones are always sold out! Jewelmint currently ships only to Unites States and Canada. Fortunately, I managed to lay my hands on a piece that I've wanted for the longest time. I first saw this necklace on youtube. It was reviewed by many fashion and beauty gurus like bebexo, raeview and hollyanaree. The necklace looks really, really pretty in the videos and promo photos. Image from jewelmint. Isn't it gorgeous? I was really excited to receive the package this afternoon, after a somewhat endless two-week wait! The bubble envelope had the jewelmint logo printed on it. The box inside the envelope. So excited! After removing the box. Notice how huge it is against my macbook pro keyboard! Love the minty hue of the box. The ribbon's actually a slip on, so I removed it by sliding it out. There's a tiny rubber extension at the back so it can be pulled off easily. This is how the inside looks like when it is opened. Love the quote! A piece of sponge covers the actual necklace. Which is a great idea and a good thing, so that the necklace won't be rattling in the box during shipping. After the sponge is removed. Earrings not shown here. This is the actual color of the rose gold and yellow gold chains! Shortest one is a knot, followed by 'love' and the longest chain carries the pave crystal bar. The chain has a 3 inch extension, so it's pretty good. I am so in love with the necklace right now. I can understand why there were so many rave reviews on this set, as it is really extremely pretty in real life. The quality is good for costume jewellery, and the design is extremely unique. I've not seen a similar necklace from other companies or at stores such as H&M or Forever21. What a pretty and unique piece of wonder! 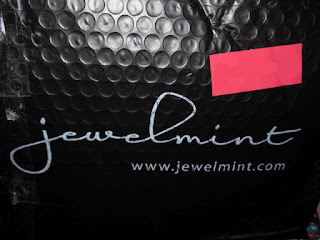 I am still waiting for my other Jewelmint goodies to arrive, so I will do a review on them when they reach too. Personally, I would say that the designs are sometimes hit and miss. I only like a few of the more classic and special pieces. Some look too typical and common, so I definitely will give those a miss.